Christopher R. Vaccaro. Long Island High School Sports. Mount Pleasant, SC: Arcadia Publishing, 2009. Photographs and illustrations. Pp 128. ISBN: 9780738565569. $21.99. Teams of fresh-faced youngsters clad in the colors of their respective high schools take to athletic fields to battle for school and personal pride. The din of drum-laden fight songs cuts though the air while squads of cheerleaders urge onlookers to root hard for their teams. Moments of incredible athletic prowess leap straight from the field of play directly into the collective memory of an entire generation of witnesses. Such are the distinct images Christopher R. Vaccaro conjures in his book, Long Island High School Sports, a recent entry into Arcadia Publishing’s “Images of Sports” series. 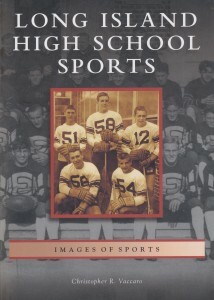 In his enthusiastic effort, Vaccaro seeks, through a wide array of historic images accompanied by detailed narrative, to share Long Island’s rich and storied interscholastic high school sporting tradition with anyone interested in revisiting faded glory years—particularly those hailing from Long Island. While the book lays out the necessary background in the introduction, it is best appreciated by those already somewhat familiar with Long Island’s high school sports landscape. With a history dating to the late 1800s, there is a lot of basic background to learn, and Vaccaro does his best to explain why certain rivalries developed or a particular coach is viewed as being a legend in their game. 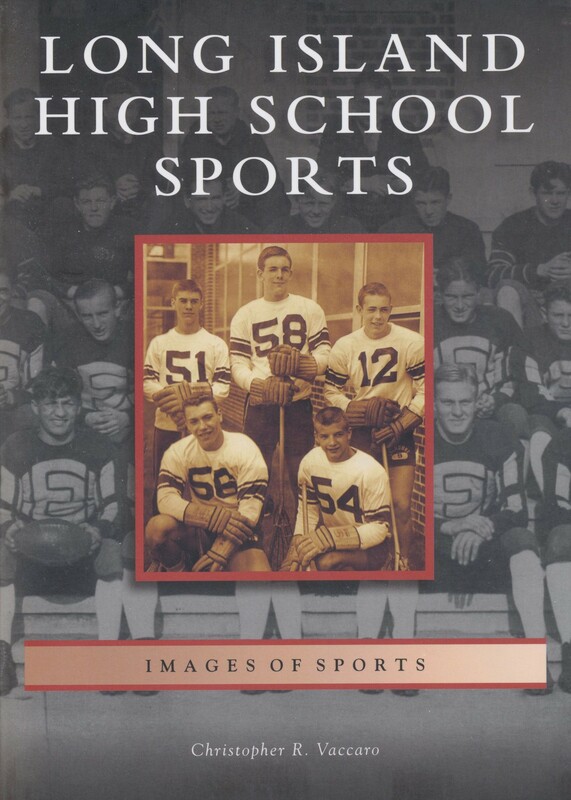 Still, given the number of sports, teams, players, and coaches detailed in the book, it would be easy for those lacking a secure footing in Long Island’s high school heritage to become lost in the sea of details. For those in the know, however, the book will serve as an intriguing overview of Long Island’s high school sporting history. As is the case with most Arcadia publications, the photographs are the stars of the show. Readers of all backgrounds will enjoy seeing uniforms of bygone eras. The leather helmets of the gridiron gangs, the almost-inconceivably short shorts donned by the boys basketball teams, and the long dresses worn by early girls basketball teams are all highlights here. Vaccaro includes some vintage game-action shots, particularly in his chapter about football, that offer detailed glimpses into the way games were played early on in interscholastic sports competition. For the most part, however, Long Island High School Sports is comprised of a series of team, player, and coach portraits, and some modern action photographs. Vaccaro’s work is best when he strikes a balance between portraits and actions shots and historic and modern images, such as in his first chapter, which covers football, and to a lesser extent, the third chapter on lacrosse. Minor imbalances exist elsewhere, though. One area that Vaccaro struggles with, perhaps due to a scarcity of resources, is that the book is dominated by boy’s sports. Girl’s sporting feats are included, but not nearly enough for a publication that is being released nearly four decades after Title IX. Additionally, Vaccaro’s book is weighted heavily towards four main sports: football, basketball, lacrosse, and wrestling. He does provide other high school sports staples such as baseball, track and field, soccer, and tennis, but these are condensed into one 20-page chapter with the unfortunate title: “Baseball, Track, and Everything Else”. While the result of such lumping marginalizes a number of fairly popular and important sports, Vaccaro makes the most of the images included in this chapter. Among the more interesting photographs featured are the 1940 Westhampton Beach High School horseshoe team (p. 92), the 1957 Friends Academy ladies archery squad (p. 94), and St. Paul’s 1900 hockey team (p. 95). These rich images serve as a sort of double-edged sword: while they certainly elevate the book’s quality, they also leave one wondering what other unique pictures might have been left on the cutting-room floor. In the end, Vaccaro’s task was a daunting one. In squeezing over 100 years of sporting history into the space of seven chapters spread over 128 pages, incredibly difficult decisions needed to be made. Vaccaro includes a wealth of information and an array of quality photographs. Perhaps, however, he erred in one of the most important decisions: the book’s title. Vaccaro leads readers beyond the realm of high school sports as he includes a vast array of photographs detailing Long Island-bred athletes from the collegiate and professional ranks. In this way, Vaccaro’s work essentially provides an overview of Long Island’s sporting tradition as a whole. Make no mistake, however, this book is a very enjoyable and informative read. But it may serve better as an overview on the area’s rich sporting heritage on all levels and as a departure point from which more detailed books covering specific sports or levels of competition can arise.